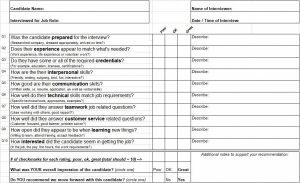 An interview evaluation form allows job interviewers to score an applicant’s interview in a consistent way, comparing candidates fairly. Data is then transferred to a scorecard used by HR or the hiring manager to determine which candidate, based on all interviewer feedback, is the best fit for the organization. In this article, we’ll provide you with 11 free interview evaluation forms and scorecards that you can customize for specific kinds of interviews and job roles. Looking to streamline your interview process? Homebase Hiring stores all of your applicants’ information, including resumes and the job board they applied from, in one place. You can schedule interviews, send out automatic reminders, and collaborate with your team to make collective hiring decisions. Homebase also makes it easy to post to multiple job boards and offers over 100 free market-tested job post templates you can customize for your business. Get started for free. 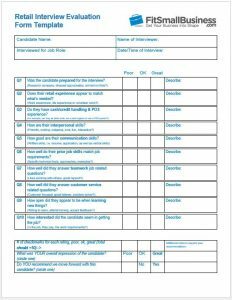 Use this template if you’re just looking for a one-page document to jot down notes and score the candidate on 5-10 job qualifications. This is the best and easiest interview evaluation form to use if your interviewers don’t have much experience interviewing. It’s simple and allows raters to assess each candidate using three choices (poor, ok, great). Because these templates are editable, you can modify each to suit your particular needs by changing the text in the categories, modifying the rating scale, or adding your own logo. The example forms below take the basic questions provided in the interview evaluation form template and customize them to specific job roles. For example, candidates for a retail job may need to have POS experience, while candidates for an administrative role may need specific computer expertise. Homebase Hiring is a recruiting software that offers market-tested job description template for these industries as well as over 100 others that you can customize and post to multiple job sites. It also keeps all of your applicant information in one place, including resumes and interview notes, to streamline your interview process. Click here to start for free. Use this template to assess retail job candidates for fit within your business and your customer base. This one verifies that candidates have the skills to run a register and serve clients. Use this template if you’re interviewing for individuals who will work in the fast-paced food service environment; to ensure you’re evaluating candidates fairly and capturing the work experience and interpersonal skills required to ensure great customer service as well as food safety. Use this template if you’re interviewing an administrative assistant as it contains questions that assess typical job skills needed by a successful admin, such as computer skills and ability to support others. Use this customizable template if you’re looking to document results from a detailed behavioral interview, not only looking at job-specific qualifications, but also at personality traits and organizational fit. The only difference between this form and the simpler versions above, is that this form has a place for you to record responses on 20 questions. 10 of those questions are behavioral interview questions based on Korn Ferry & Lominger Competencies. 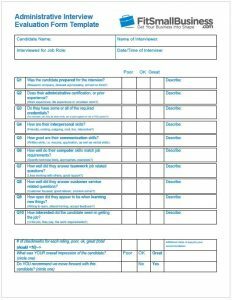 In addition to basic training on how to conduct an interview, and showing interviewers how to use this form, you may want to explain why you chose specific behavioral and technical interview questions on this 2-page template. Otherwise, this form is scored in the same way as the simpler versions above. The only real difference is it has more questions. These forms use the same format provided in the complex interview evaluation form above and further customize the behavioral and technical questions to suit specific job roles. For example, managers need to be able to inspire team members, project managers may need PMP certification, and technical team members may need to have very specific hardware or software expertise. This version of the interview evaluation form adds questions relevant to managerial roles, assessing what some consultants refer to as the Big 8 — those job competencies that are both hard to develop, and critical to the success of a manager/leader in an organization. Use this template if you’re evaluating candidates for technical skills. You can customize it by listing the specific hardware, software, or project tools the job requires, such as Asana or Trello. This interview evaluation form includes 10 behavioral interview questions specific to the kind of competencies required by technical staff in addition to the 10 questions used to evaluate most candidates — questions about communication, teamwork, and customer service. Because project managers do the work of managers without direct supervisory authority, this template includes competencies identified by the Project Management Institute (PMI) needed by project managers — such as the ability to manage conflict, prioritize work and motivate a self-managed team. Whether you use our templates above or create your own, an interview evaluation form should have basic candidate information and job-related questions. Every interviewer should use the same form so that data can be gathered consistently and candidates assessed fairly. Name of interviewer — this is the name of the person conducting the interview. If you are conducting a group interview with a candidate, each interviewer should have their own copy or electronic access to the interview form to fill out for that candidate. Evaluation criteria — some way to rate or score the candidate on each question. Our templates use a simple 3-point scale, asking raters to choose from 3 options for each item — poor, ok, or great. You might prefer to use a 1-5 scale, where 1 is poor and 5 is excellent. Questions — You can have as few or as many questions as needed. Our templates provide 10 questions for the simple interview and 20 for the more complex interview. Summary rating — Provide some way to add up your ratings and get a more holistic look at the candidate. Our templates simply count the number of ✓ check marks, but you could also weight each rating, such as poor=1, ok=2, great = 3 and then total the points-value as a numeric sum. For example: (5) ✓ checkmarks in the ok column (worth 2 points each) would equal 10 points total. Recommendation — This section is important to find out whether the interviewer would recommend that the candidate continue to the next step in the hiring process. It’s a subjective recommendation based on both the ratings and the interviewer’s gut feeling, which sometimes isn’t captured in the scoring. HR or management uses their recommendation as just one ‘opinion’ as they compare all interviewer’s ratings. Comments — this section is deliberately small, to make note only of the rationale for moving the candidate forward or not, such as “not enough job experience” or “one of the top 2”. Watch out that nothing discriminatory is written on the form, such as age, pregnancy or mention of a disability. 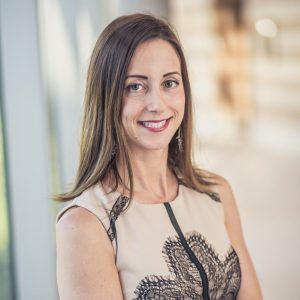 Be careful when you create your interview evaluation form that you do not inadvertently encourage interviewers to ask or rate anything that could be subject to discovery in a litigation process, such as any demographic, gender, or other protected-class information that may violate labor laws. Even seemingly harmless data, such as a candidate’s date of birth, can cause unintended interviewer bias based on age and violate federal law. Here are more questions to avoid and illegal questions you cannot ask during the hiring process. Note for EEO purposes demographic data may be gathered by HR and maintained separately from the application/candidate file. However, it does not belong on the interview feedback form due to the risk of potential discrimination. Once individual interviewers have completed their rating of an individual candidate, you can input that data into an interview evaluation scorecard to compare everyone’s interview ratings for the same candidate. This way, you can determine the average rating for each candidate and decide (without bias) whether or not you should move the candidate forward in the hiring process. Of course, if you have only 1-2 interviewers, e.g. 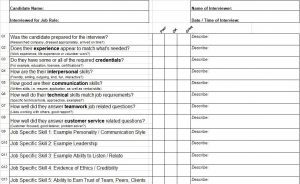 you and the supervisor, you may not need to use a scorecard like this as you can view your interview evaluation forms side by side. 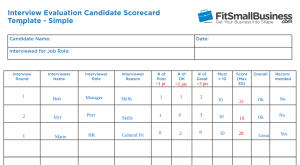 If you’ve used the simple, 10-question candidate evaluation form, then you can transfer the data to this scorecard template and get comparative ratings, showing average score and overall count of those who recommend this candidate move forward to the next step in the interview process, such as a final interview. This is great for a side-by-side comparison of how each interviewer rated the same candidate. In this example, we scored each candidate based on poor=1 point, OK=2 points, great =3 points (since there are only 10 questions, the max ‘score’ is 30). We then transferred each interviewer’s (subjective) overall rating (poor, OK, or Great) to the overall column and noted whether they recommended the candidate move forward. See the example below, and then download and customize your own version. 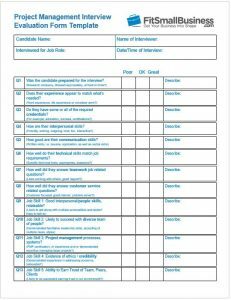 If you’re wanting to compare interviewer ratings of a candidate for a higher-level job, one for which you used the more complex 20-question behavioral and competency based interview form, then use this scorecard template to input the interviewers ratings. It’s scored exactly like the form above, although your totals and averages will be higher based on the number of questions you assess. 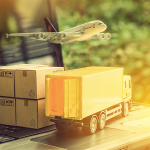 You can then obtain an average rating for the candidate overall, and determine next steps, such as a final interview or a request for a sample work product. Once all your interviews are complete for all your candidates for a given position, you’ll need a way to capture the summary data for each candidate and compile it into a comparative scorecard. This lets you compare how candidates performed in the interview on an apples-to-apples basis. Here’s an example of how the data might look for three candidates who interviewed for the same retail job. This tool allows you to document and rate candidates fairly and can come in handy if you ever have a claim of interviewer bias or unfair hiring practices filed against your company. You would be able to show how each candidate compared to one another and will have documentation as to why you choose to hire one person, and not to hire another individual. You’ll notice that Sue’s average ratings score was higher than Billy’s, and so is her average overall score (which is a subjective rating, averaged across all interviewers). Sue is the top candidate per HR (whose data has been added in blue) in terms of candidate rank and whether or not to proceed. After evaluating and scoring the candidate, if you choose not to move forward, please consider sending the applicant a professional rejection letter to maintain goodwill, and to encourage the applicant to apply for other positions which may be a better fit. Like most business tools, the exact interview evaluation tool you need is one that’s right for the specific job. So if you want to keep it simple, with 10 or fewer questions, and printable on one page, download and customize the simple interview evaluation template. But if you’re hiring your first manager or interviewing for a senior-level role, you might consider using the more complex template. 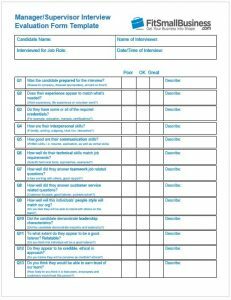 We’ve also provided 3 versions of interview evaluation scorecard templates for you to choose from, both to compare interviewer feedback on a candidate and to compare multiple candidates against one another for the same job. We hope you find these useful to select the best person for the job every time. Remember, interview evaluation forms are only one part of creating a fair and efficient interview process. An applicant tracking system like Homebase keeps all of your important hiring information in one place, including resumes, interview notes, and which job boards they applied from. Get started for free. Excellent data for reference . Compare candidates fairly and score your applicants interview in a consistent way.